a) To control all fundamentals through and after shot release. b) To evaluate the execution of the shot with a view to improvement. Perfect control of a shot demands full attention, as the critical moment of actual shot release cannot be precisely determined. To ensure that concentration goes beyond the hammer fall and the projectile leaving the barrel, all efforts towards creating a perfect shot must be extended beyond the actual shot release. Only full awareness of all fundamentals can bring about correct analysis of technique. Follow through is part and parcel of any sport one can name. An example of this is the golfer's swing. After the ball is hit, the golfer continues to swing the club into follow through. a) Increased muzzle wobble at the time of the shot break. b) A sudden rise in the muzzle - often whilst the bullet is still in barrel. c) Inability to correctly nominate shot placement on target. CAN FOLLOW THROUGH BE SEEN? Only partly. Trigger press, stance, breathing and holding can be observed, but not focus on sight alignment. Continue sight alignment, trigger press and all other basics for a perceptible period of time after the shot is released. In doing so, the ability to nominate the shot is facilitated. It is essential that each component of the basics, not only be employed up until the shot release, but continued through and after to ensure smooth, uninterrupted shot release. This applies to stance, grip, breathing, holding, sighting and trigger press - all of which must be maintained constantly through the entire procedure of the delivery, until well after the shot has hit the target. Focus on the front sight is continued to ascertain the exact position of the front sight in the rear sight notch at the moment of shot release, regardless where the sights finish in recoil. 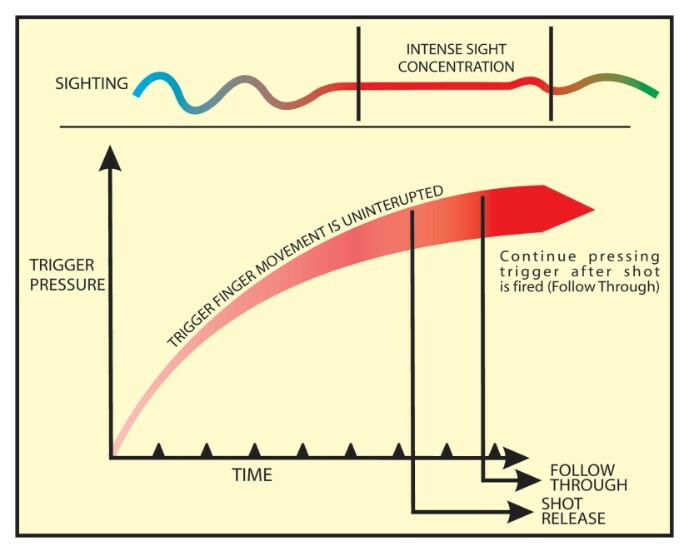 After the shot has gone, the recoil will disturb the sights out of alignment, but follow through on the focus of the front sight must be maintained. Once the trigger finger starts to move, it should not be interrupted so as to give an even pressure until the shot is released. This trigger pressure is continued even after the shot release. Imagine an extra 5mm of travel in the trigger to emphasise trigger follow through. YOU WERE ENDEAVOURING TO DO BEFORE THE SHOT.